We aren’t hiking this week. A sprained ankle (not mine) means no long beach walks and no hikes up hillsides. But I was still itching for some photo opportunities…so we set off on an adventure this afternoon. And without thinking the details through, we headed off toward a rest stop with an ocean view off the 5 past Camp Pendleton. As we passed the last Oceanside exit, we noticed heavy traffic coming back toward the south and realized that turning back around toward home might be more complicated than we had considered. 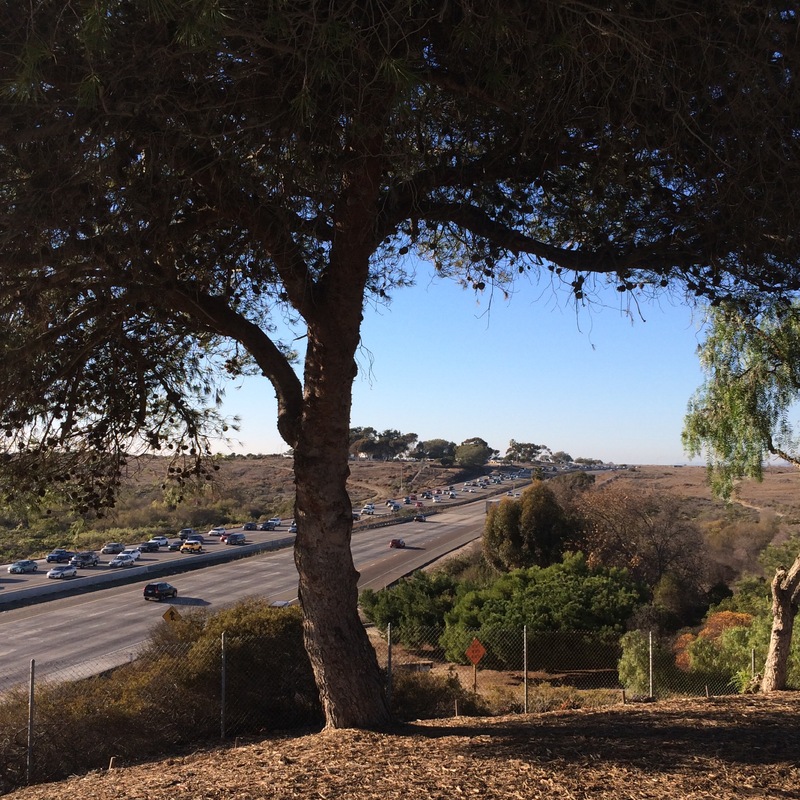 As we pulled off onto the northbound rest area to take a look at the view, we thought we might have to go all the way to San Clemente to turn around and come back. It’s interesting the way the dryness of the west and the blue of the ocean and the brilliant blue sky converge to create near summer-like conditions at the end of November. 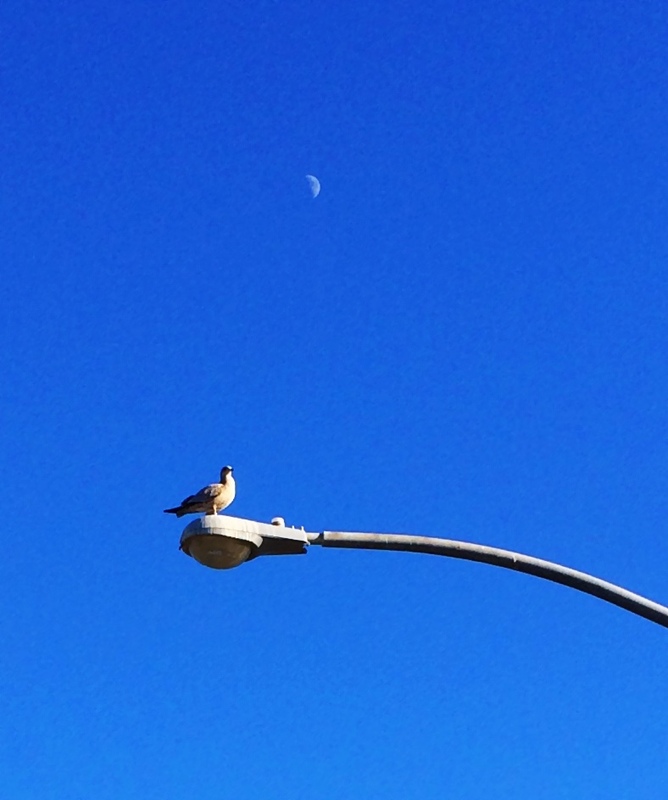 I looked up and noticed this seagull sitting on a streetlight with the moon in the background. As we returned to the freeway, we were prepared for quite a drive ahead. Lucky for us, there was one more offramp just a mile up the road that allowed us to access the southbound freeway. After creeping back in very slow freeway traffic for the three miles or so back into Oceanside, we took the offramp off toward the harbor in search of the nearby pier. With the short days of fall, the sun way already low in the sky. And in spite of that (or perhaps because of it), the beach was teeming with people. Surfers were thick in the water, families frolicked on the shore, tourists explored, and photographers were posing their subjects with the pier and beach as the perfect backdrop. 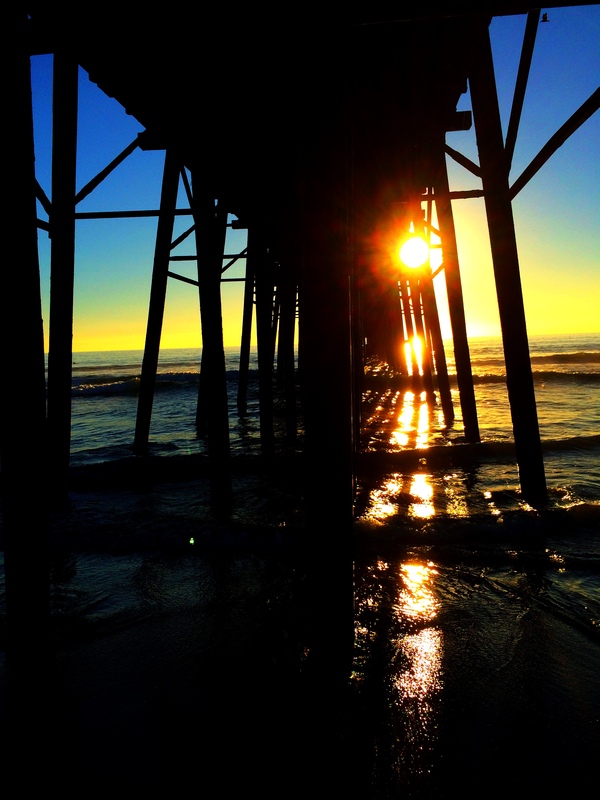 I headed under the pier, searching for the convergence of sunlight, shadow, pier pilings, and water. 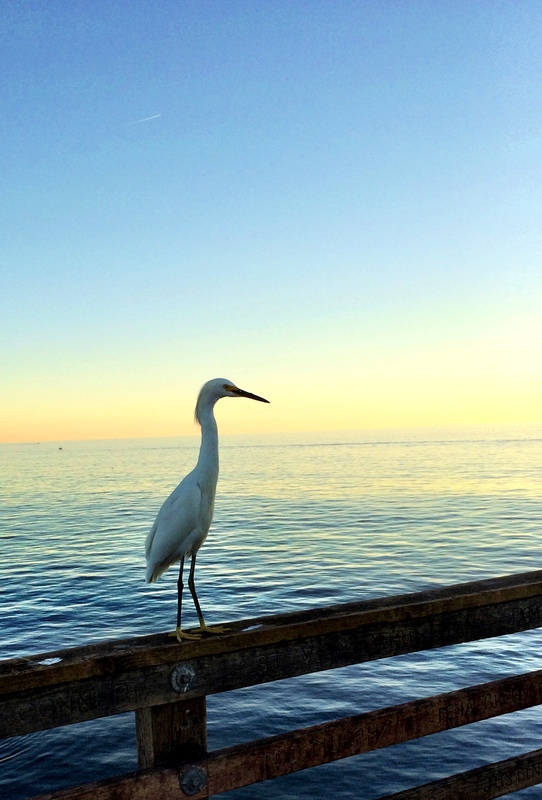 Walking onto the pier we noticed this egret posed on the railing, outlined against the setting sun. The pelican seemed to be tame, unperturbed by all the amateur photographers and onlookers. 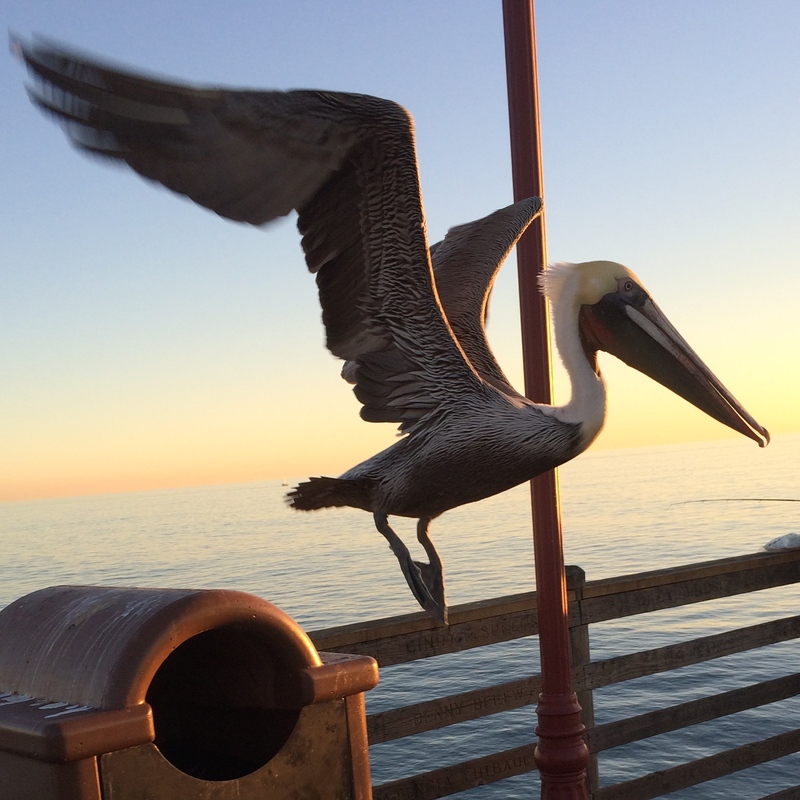 At one point, the pelican noticed the small fish the fisherman had pulled up and extended its large wings and took flight…just as I pressed the camera shutter! 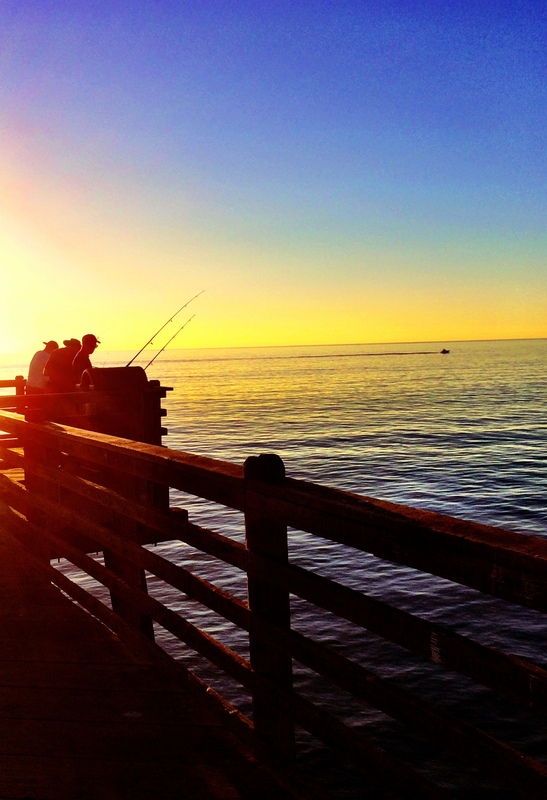 I couldn’t believe the numbers of fishermen on the pier. I didn’t notice many fish, but there were fishing poles lined up all along the railing, some spread out and some gathered in small bunches. As we headed out, the sun was low, washing a warm glow over the pier and palms…a perfect ending to an impromptu photographic adventure. Conditions converged for a wonderful day! 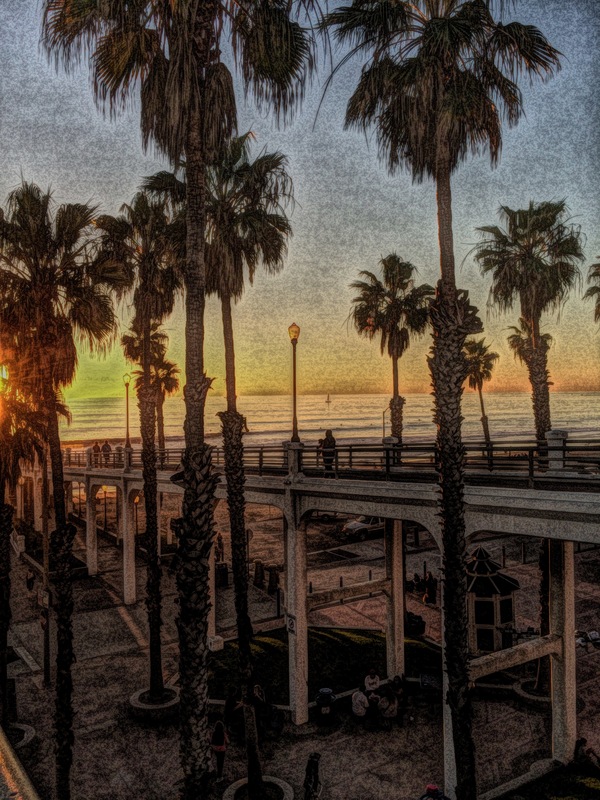 This entry was posted in photography, Slice of Life and tagged converge, daily post, iphoneography, oceanside, pelican, photo essay, postaday, sunet on November 28, 2014 by kd0602.